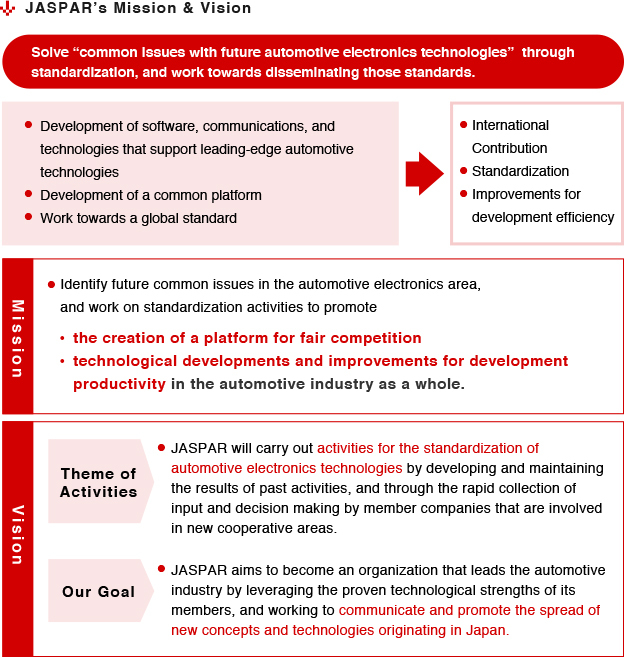 JASPAR (Japan Automotive Software Platform and Architecture) is a standardization organization established in Sep 2004 to improve development efficiency and to ensure reliability through standardization and sharing of sophisticated and complex electronic control system automotive software and network. We have been participating as JASPAR executive committee member since its establishment, managing its event, meeting, member, fund, information, and public relation to ensure a smooth operation. Engineers from various industries such as automobile manufacturers, suppliers, semiconductor manufacturers, developers of embedded software, and other professionals in car electronics sector participate in JASPAR. We work together with other standardization organizations in Japan and overseas to promote standardization of automotive LAN, software, micro-controller, and multimedia. To facilitate discussions in technical fields such as functional safety, automotive LAN, and multimedia, we have set up 9 working groups for our members to actively participate in the discussion. The era of automobile driving and advanced driver-assistance system is just around the corner. With local deployment and global compatibility as our focus, we aim to secure standardization technology and to solve our common issues in car electronics sector.